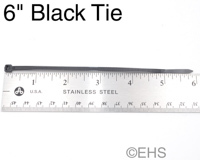 Pack of 100 6" black wire ties. This is one of the most useful sizes of ties, and it is long enough to wrap a normal bundle of wires and not so long you have to cut off a bunch. These are good to combine with the tie pads for securing cables to racks and other furniture.